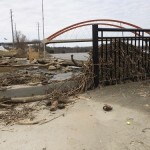 As the roadblocks were removed from the 1st street underpass on Monday, the cleanup is well underway in Hastings with equipment starting to remove the large tree trunks, logs and other debris that had collected in the area behind the pavilion in Levee park. The sturdy memorial columns and the wroght iron overlook with it’s picnic tables and benches are now visible again, albiet draped in rivergrasses and other weeds tightly tucked into the bars. Hastings Public works used a small clawtype backhoe to lift segments of logs once they had been trimmed by a giant chainsaw. The section of trail that was submerged for nearly 2 months seems complete, although some damage has been observed in other areas. A brief update from Chris Jenkins before Monday’s council meeting shared some impact on the dock at Lake Isabelle while the fishing pier at Lake Rebecca is still an island with substantial flooding throughout the lower areas, parking lot and picnic grounds. The water level at Lock and Dam 2 on Monday night stands at 15.45, just a bit over flood stage but projections by the Weather Service predicts a return to near 17.00 by Monday, Aprll 22nd with rainfall later in the week. We asked Public Works Director Nick Egger for an estimate of costs that may be attributed to the flooding and were told it is too early to make a prediction of total flood related costs.